With Windows 10, Microsoft integrated an existing feature of Windows Phone 8.1: Wifi Sense. 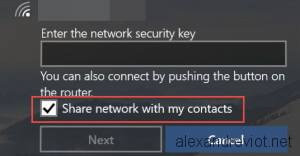 It lets you to share your Wifi passcode with your friends in Facebook, Skype or Outlook. This feature can be friendly for public people but if you are more concerned about your security network, you may want to disable this feature. In the first time, Microsoft says that information sent between you, Microsoft and your friend are fully encrypted. And in second time, a person who got access to your Wifi with Wifi Sense will only have access to internet, and not your internal network. If he needs to access a share or your printer, he needs to enter the passphrase. Let’s see how to disable this feature.